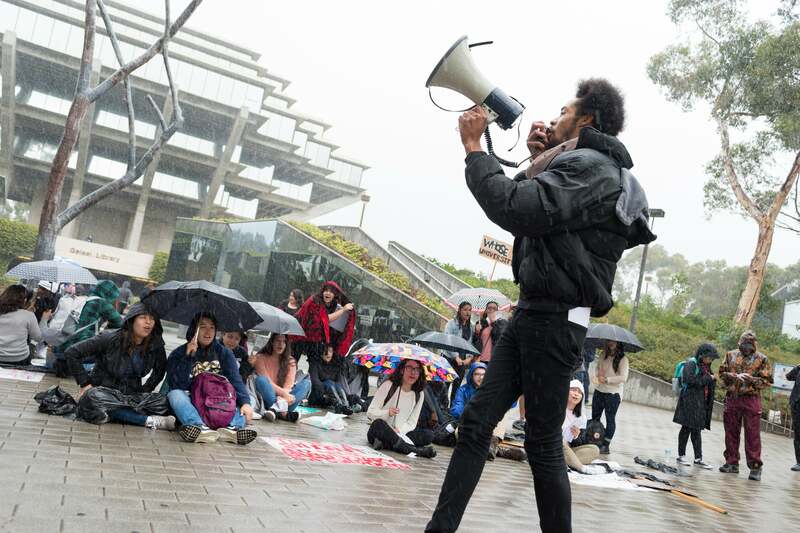 Dozens of students from across campus gathered at the Silent Tree on Monday where they chanted and expressed their concerns in response to a tuition hike requested by the UC Regents and the CSU Board of Trustees. The Students Affirmative Action Committee organized the protest against the tuition hike, which, if approved this January, would raise tuition for UC students by approximately $300 for the 2017–18 academic year, an increase “roughly in line with 2.5 to 3.1 percent,” according to the University of California’s executive vice president and chief financial officer, Nathan Brostrom. The increase would be covered by financial aid for 65 percent of students. Following the chants, attendees were given the opportunity to speak in front of protesters as well as those who gathered to watch. Marshall College junior Dellanira Alcauter was one of the organizers of the demonstration, and spoke to the UCSD Guardian about what compelled her and her colleagues to stage a protest. Turning her focus to the effects of high tuition, Alcauter explained that with high costs, the ability for students to take care of themselves is hindered, causing them to make a choice between paying for higher education or caring for their health. Two years ago, the Regents and Gov. Jerry Brown agreed to freeze tuition for in-state students for a minimum of two years. This means the UC system and and California State University are allowed to increase tuition by the rate of inflation starting in 2017. According to A.S. Council Vice President of External Affairs Lauren Roberts, although the increase is smaller than the hike proposed two years ago, the Regents’ approach to proposing the increase is also different. She also added that the timeline of this tuition hike is different than that of two years ago, and that efforts to stop it will differ because of this. Claire Doan, the media relations officer at the UC Office of the President, provided “context” when asked about the student response to the newly proposed tuition hike. Doan also explained how the increase in the price of tuition will benefit rather than disadvantage UC students. “The modest increase will allow the University to maintain the quality of education by increasing financial aid support, lowering the student-faculty ratio, increasing course offerings and enhancing student support services,” said Doan. Last week, Alcauter and other UCSD student drove to UCSF to attend the UC Regents meeting, hoping to have an opportunity to voice their concerns with the individuals who represent them. Alcauter told the Guardian that organizers have the same goals they had two years ago. According to Roberts, protests are expected to continue until UC Regents vote on whether or not they want to raise tuition at their meeting this January. 12/5/16 12:01 p.m.: Information and response from UCOP added.